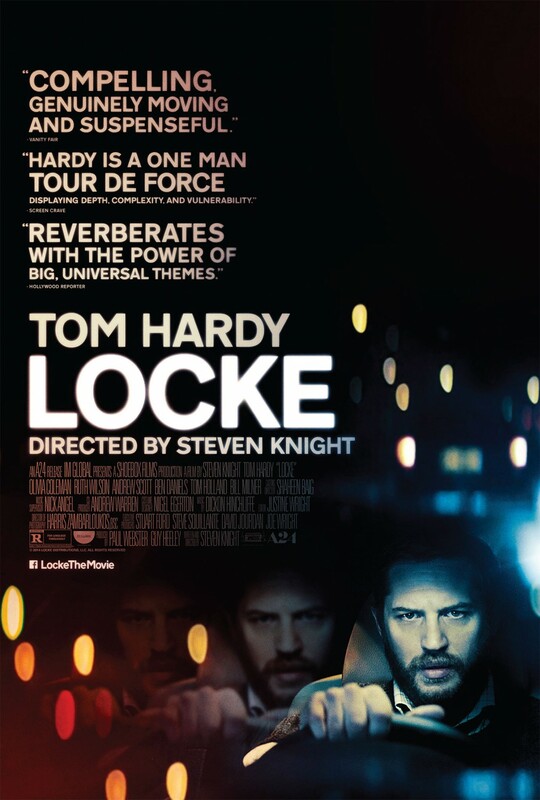 Locke is one of those films that I heard so many people talking about that it piqued my interest, plus it has Tom Hardy as the star. As much as I wanted to love this movie and I do believe it has some merits, it just didn’t work for me. The premise of the film is simple, a man Ivan Locke, gets in his car on the way to the hospital where his newborn baby by his mistress is about to be delivered. On the way there he is dealing with his job as a concrete foreman, where he is involved on a new, very important project that he must oversee to completion and he carries with him the burden that he must unravel the truth to his wife. Directed by Steven Knight, the movie is experimental in that throughout the entire film, he remains in the vehicle. He is the only protagonist that the viewer sees at all. Other voices are heard while he talks on the phone with them in his car, but they are never seen. We can only imagine their reactions at the news he delivers and how the other people on the end of the line are feeling. He must come to the consequences as a man for the things he has done in his past. What he has done to his wife Katrina (Ruth Wilson) and his family and where he will end up, that is the question. On top of the drama that is occurring in his personal life, he is coaching his co-workers to help him with the concrete project that heavily relies on his orders to get done. The premise is interesting, but I would have preferred to have seen other actors in the film. The reactions of his wife and his mistress would have played out well in the film and this could have been a really exciting one to watch. Hardy does a great job as an actor; he pushed the envelope and poured his feelings on to the screen. To be able to take on a feat alone, I am sure carried a heavy burden for him and he executed it flawlessly. Hardy has a great way of conveying emotion through his eyes and this ability worked great for this type of movie. I know he won some awards for his work in this film and he definitely deserved all the accolades. Many of the shots worked from an aesthetic point of view and helped to develop and convey the emotions in the scenes. I liked how the colors of different car lights and the highway created a sort of movement. As if we were driving alongside him and only see the glare of the lights. These colors bounce off his car window and add to give us an idea that in a way his actions are driving him crazy. Overall, I thought this movie was okay, I understand the artistic point of view and for that I think it did a great job. I definitely give the director and Hardy credit for their work. But I felt bored with the film and I wanted it to end or for something to happen, anything at the halfway point of the movie would have helped. If you want to see it for the artistic aspect of it, then I think it is worth watching, but if you are in the mood for a drama and something enthralling, then you must look elsewhere. In fact if you are interested in seeing this movie, just watch Luke Abbott’s version that he did for Cara’s blogathan last year and you will save yourself a few bucks and 2 hours of your life. Hell yeah loved it more! Sad you didn’t enjoy this that much. It was one of my favourites of 2013. I know this should be in the list of movies I should like, but didn’t. I am glad you liked it though, woo hoo! Hey Queen Mel! Wow you managed to write a review before SDCC, I’m impressed!! 😀 I quite like this one though I could see how some people might find it boring. I think because I like Hardy I was quite mesmerized by his performance and the story has an intriguing psychological aspect that made you think about it for days. Thanks Ruth, this week has been busy for me with work. So try to get to that soon. I did not get to see the Outlander panel… that day ended up turning into a mess and I was done waiting in lines. Comic con does that to you! What was the surprise??!!! Yeah it’s a smaller room, but it doesn’t matter what room it is in there is a line to get into all of them. It’s crazy!! There’s not a lot going on in this movie, but Hardy is irrepressible and I thought it was admirable how much you can feel with very little to go on.